For several years, marketers have paid close attention to the latest thinking on social media: which platforms one had to be present on, and which tactics worked the best. But two recent surveys suggest that paying too much attention to social media platforms may distract marketing resources from other important conversion strategies. To be specific, all those tried and true communication channels – like email and school websites – continue to be heavily influential in students’ decisions about where to apply and enrol. Therefore, too little investment or attention in these areas can cause schools to lose out on prospective students who might otherwise seriously consider enrolling – or to waste time on less-qualified prospects who aren’t as serious in their intentions. The white paper is based on research conducted in May and June of 2015 in the US among 218 admissions officers as well as a previous late-2014 survey of 1,611 American teens interested in applying to schools. 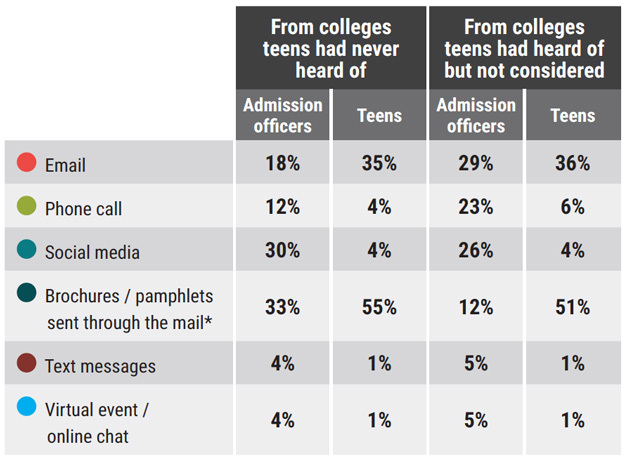 Admissions officers were asked about their perceptions of how teens are researching colleges and universities, and their responses were then compared to how teens said they like to communicate with schools. While the sample for the Chegg/mStoner research is American, the inquiry and results provide insights that can inform educators and recruiters in other markets as well. “Where are students hanging out online?” The answer to this question has become an increasing preoccupation in education marketing over the past several years. And for good reason: Students live a good part of their lives online these days, so it would be silly not to try to connect with them while they’re there. Indeed, there is a growing body of evidence that points to the increasingly important role of online channels in student recruitment. However, the “Mythbusting Admissions” white paper draws a line around what makes sense for educators’ social media outreach, noting that chasing students on every new platform is probably not the wisest use of staff time or marketing budget. Where students are open to communicating with institutions, the white paper explains, is Facebook. While teens are using Facebook less and increasing their use of other platforms such as WhatsApp and Instagram for connecting with their peers, they continue to use Facebook for other reasons. In fact, the US teens surveyed by Chegg said that Facebook is still the social media channel they use the most to research colleges. That said, teens want to engage with schools on Facebook on their own terms. The white paper revealed an important gap between what admissions officers think is a good idea on Facebook and what teens want. More than 70% of admissions officers said they think students are willing to be contacted through Facebook and Twitter. While this is true, according to the 2014 Chegg research, the caveat is that teens want to be the ones initiating the contact. In other words, students want to reach out to institutions on these channels, not the other way around. What’s more, only 4% of students said they wanted any kind of social media to be their first point of contact with an institution. As we noted in an earlier, related post on Chegg’s 2014 survey data, channels such as online search and college selection sites are likely to play a greater role, and particularly so at the early phases of the students’ decision-making process. The following table, adapted from the white paper, illustrates this point. How best to reach students in the first place? Email is really important. Over nine in ten of the teens surveyed by Chegg, in fact, indicated that they would prefer to receive information about an admission decision, financial aid, or application confirmation by email. Another assumption the Chegg/mStoner research dispels is that conversations with admissions officers are important influencers for prospective students. More than seven in ten (71%) admissions staff said they believe such conversations are important sources of information for teens before they decide to apply, compared to only 37% of teens. One area the surveyed admissions officers had completely right is the importance of mobile for prospective students: 87% thought teens were visiting institutional websites on their mobile devices, very comparable to the 81% of teens who said they actually had visited a college website on their phones. This entry was posted in Higher Education, Marketing, Most Popular, North America, Regions, Research, United States and tagged education abroad, undergraduate admissions, student enrolment, study abroad, colleges with international students.